Brothers Sam Lock (J.D. ’98) and Jeb Lock (J.D. ’05) still recall the first cases they handled while students in the St. Mary’s Law Criminal Justice Clinic — from traffic tickets to alleged assaults. Jeb Lock, who has a private criminal defense practice in San Antonio and is a part-time judge for the Bexar County Magistrate, said his first case resulted in a dismissal of an assault causing bodily injury. He remembered how happy and appreciative his client was of his work. “That let me know what defending people accused of crimes is really all about and how much satisfaction we can receive from doing our job,” he said. His older brother Sam Lock had a less favorable view of the court system before he began the clinical program. While in high school, Sam Lock said he had been a complainant in a case and thought court was awful. “What a terrible place to be every day,” he said of his first impression of the legal system. Sam Lock came into law school knowing he wanted to be a courtroom lawyer and also knowing he wanted to take part in the clinical program, which solidified his ideas about what it means to practice law, and assured him that it was his calling. 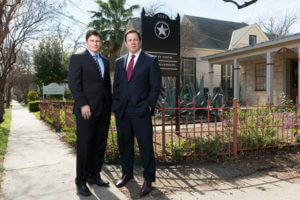 Now Sam Lock is a criminal defense attorney whose practice extends from San Antonio into Guadalupe, Comal and Hays counties. Sam Lock said working with Clinical Professor of Law Stephanie Stevens and her husband and criminal defense attorney Mark Stevens, who is an adjunct with the clinic, was inspirational. “It’s not only that they put out people who are good lawyers, but those people are also loyal to the ideals of the clinic and criminal defense in particular,” Sam Lock said. Jeb Lock said he can easily spot new attorneys in the courthouse who have gone through the clinical program. “You can see the extra work they’re putting into their cases and the preparation they put into the motions they are filing and arguing,” Jeb Lock said. Sam Lock said countless people, beyond the clinic clients, have been affected by the work of the clinic, when you include the family members of those helped and the many clients who have knocked on the doors of lawyers who have graduated from the clinical program.